From about 7 or 8 years old, I used to love finding things out in the fields whilst out playing with friends, clay pipes, pieces of pottery, old bullet cartridges, all of which I would normally tuck away in the back of one of my drawers, until my Mother had a clear out. Well, this week I came across a couple of new finds. Firstly, I was introduced to the word ‘Shoddy’! I had often heard the word and understood that it meant that something was of poor quality or was referring to bad workmanship. But where did the word come from? Since we moved here, I regularly find buttons in the soil. When fencing was being put in, when I was digging the veg patch, whilst clearing mole hills, they just kept surfacing. These were often the same sized buttons and often from the same manufacturer, ‘Archibald and Co London’, who from a bit of research appeared to be a manufacturer of army or forces uniform buttons. I wondered, was there a button factory in our location at some point in time? I didn’t do a great deal about it, but once again this week another button appeared in our new paddock, as I was checking the grass. This time it was a different kind of button as it looked like a uniform dress button. So I did a bit of investigation and spoke to one of the local farmers Gordon and his wife Angela, who’s family have farmed this area, including, many years ago, the land which we now have, to see if I could find out more. ‘Shoddy’, appears to originate in the Batley area and as far back as the 1800’s is the name given to scraps of inferior woollen yarn which was mixed with new wool to produce cheap cloth. Anyway, any parts of the rags or cloth that was not suitable to use would be left to rot and then sold on to farmers as ‘Shoddy’, to fertilise their crops. Angela, was telling me that after the war she remembers truck loads of ‘Shoddy’ being delivered from West Yorkshire and it would be ploughed into the fields to support the growth of crops and in their case it was sugar beet. Very often, old forces uniforms were used as part of this process, as their was an abundance of them at that time. That is why in fact I have kept finding the uniform buttons. Well, I’m glad that mystery has been solved. After recently getting the ditch through the garden cleared out, I was walking through the garden early last week and I spotted something in the now deeper, clearer ditch. It appeared to be a bottle and after jumping in and fishing it out, I could see for myself that it was in fact no ordinary cast away coke bottle or alike. 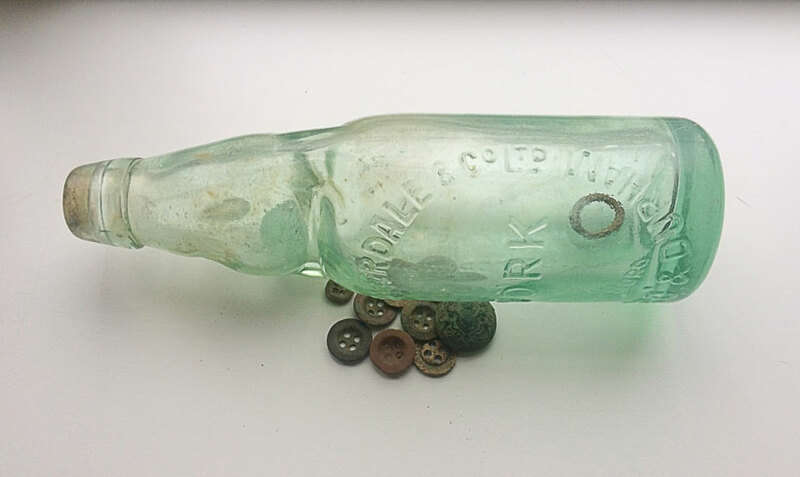 It was an old glass bottle and the neck of the bottle had been pinched together during the manufacturing process and rattling about in the neck was a glass marble. Well, to say the least, this little fella was excited, just like all those years ago as an 8 year old, finding his first clay pipe. So, after a little homework on the internet and talking to Gordon again, it was established that this was an old lemonade bottle from a factory in York and was up to 80 years old. I could just picture some young farm worker, on a hot summer day, tossing the bottle aside as he pulled his trailer of newly baled hay down the lane!